£10k for a SubC no date, used, £30k for a Kermit! Gotta pay those crazy rents somehow!!!!!! I just treat it as a place to window shop. They take the mick. Why shouldn’t I? Is you want to see how insecure these sorts of markets are, have a look at the price of antique furniture over the last two decades. There’s no such thing as a safe one-way bet. And that has to include watches. Wow... I know we go on about it a lot but has there ever been a situation like this where a luxury good is in such high demand that prices go like this?! I spotted the 30k LV in Burlington arcade last week, we’d just come from the Rolex AD in Bond Street looking at Datejusts and a black dialled Oyster Perpetual, the staff member tried to imply the value of Rolex go up 30%.....it felt like that LV was doing all the work for everyone’s Rolex!! Ironically , try selling them a watch , they offer peanuts ! They must be making 100% mark ups in there , at least ! 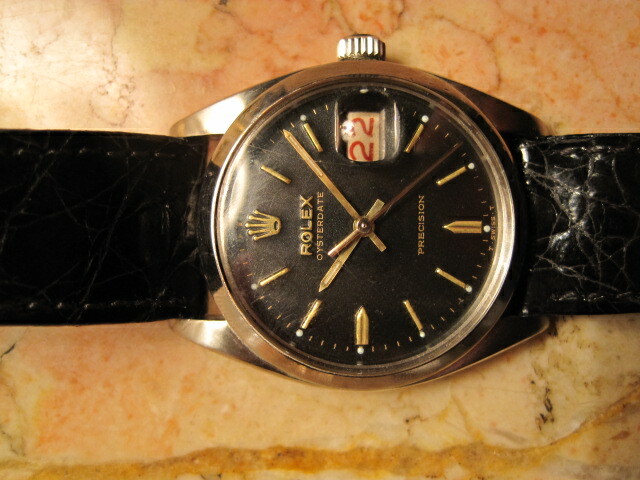 I bought my first Rolex at the Vintage Watch Co. in the Burlington Arcade, a 1958 6494 Oysterdate, in Feb '06. I paid £2.2k. Kind of glossy dial (probably refinished) with yellow gold indices and hands and at the time, it was the most wonderful object in the world. With hindsight, I could probably have picked up something similar at a watch auction for what, £500? Maybe less? So it feels like their mark-up, as a percentage of the market-clearing price, is pretty consistent over time? It seems to have worked well for them over the years. As everyone is well aware it’s a guaranteed investment as will only go up in value. You’ll be kicking yourself when they’re 45k. Investment? With any investment you earn your money when you buy. Pay too much and its not such a good one if at all. Simple rule. I guess the arcade shops price stuff in windows leaving a lot of room to move and make the customer feel they are getting a good deal. from time to time a tourist walks in...or anyone that isn't a WIS but has decided they must have a rolex, and they get MILKED! Prices like that are not real though, I guess a simple lunch in the same area is horrendously overpriced, it’s the tourists that pay it so why shouldn’t they ask it? I guess that’s a joke? The only people who’ll be kicking themselves are the ones currently paying over list for ceramic Sub’s (and other Rolexes) These will not be an investment. Almost everyone who has one keeps it mint with b&p these days, they’ll all still look brand new and shiny in 20/30 years thanks in part to the ceramic and there’ll be a thousands of them on ebay mint in box. I guess we have to remember for a lot of people the buying of a watch of this value is usually to mark an occasion or event? The whole 'shopping experience' is part of that process and therefore they may be willing to overlook (or are oblivious to the fact) that they might be overcharged, a little! ?